Canon Pixma printer just £30 in Aldi Specialbuys sale – should you buy it? Starting from today, Aldi is selling the Canon Pixma TS3150 printer at £30 in store and online as a Specialbuy. But you’ll have to act fast if you want to grab one. On offer while stocks last, Aldi says that the Canon all-in-one printer has ‘everything you need to get started’. However, we weren’t impressed when we tested this model last year. A surprisingly low price may seem too good to be true, so is this Canon printer a brilliant bargain or a discount dud? Keep scrolling for a look at its key features, and for details on other printers in the Canon Pixma range. As this Canon printer arrives with built-in wi-fi, you can sync it with your Android or iOS smartphone to start a printing job in a couple of seconds. 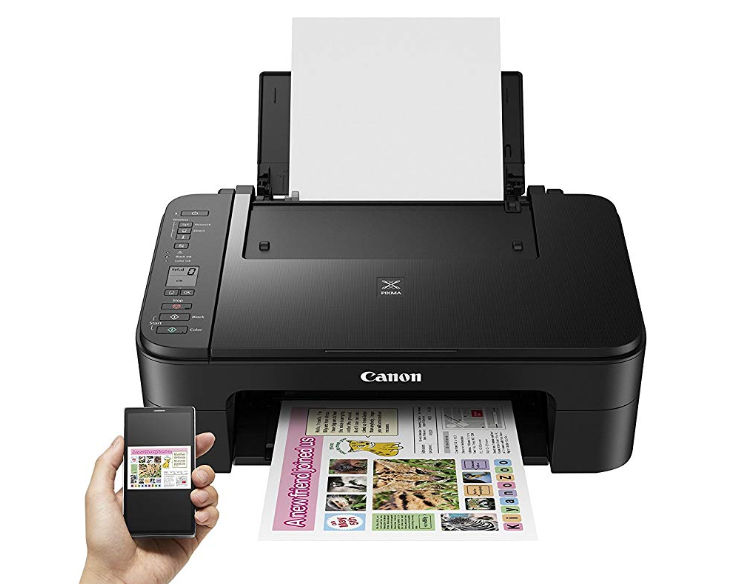 The Canon TS3150 is compatible with Google Cloud Print and Apple AirPrint, or you can download the free Canon Print app to give it some orders. Canon is convinced that its Pixma printer can handle some bumps and scrapes. The top surface of the budget-priced printer is made from a fingerprint and scratch resistant material, making it ‘easy to maintain’. This Canon model supports the printing giant’s XL cartridges, which means they’ll need replacing less often. An inexpensive printer could fit nicely if you’re shopping for a machine that can handle basic tasks. But this Canon simply isn’t good enough to earn a Which? Best Buy sticker. Head over to our full Canon TS3150 review to find out why. The Pixma range makes up part of Canon’s inkjet family. Prices for Canon Pixma printers can go from £25 to more than £250. For an overview of the range, see all of our Canon printer reviews. Otherwise, see below for a trio of Canon Pixma printers at different price points. What is it? 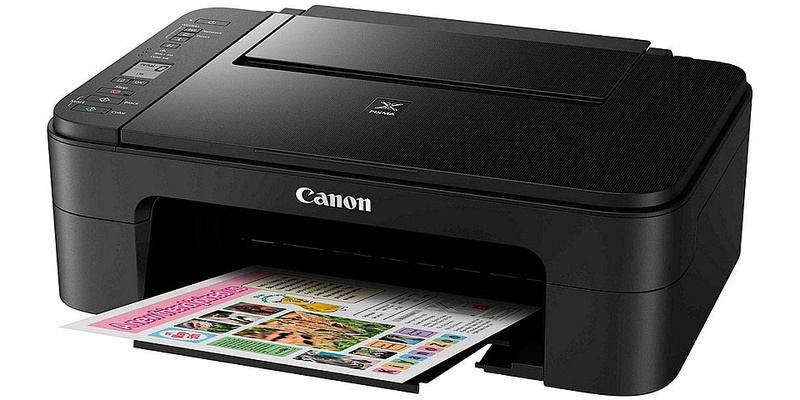 An affordable all-in-one Canon printer that can copy, scan and fax. Key features? Wi-fi functionality means that this printer is compatible with Amazon’s Alexa voice assistant. It has an automatic document feeder and prints on both sides of the page. For more details, see our Canon Pixma TR4550 review. What is it? A premium inkjet aimed at people that print regularly. It follows in the footsteps of 2017’s Canon Pixma TS8151. Key features? This printer can hold up to six inks – black, pigment black, cyan, magenta, yellow and photo blue. If one colour runs out, you don’t need to replace the whole pack. An SD-card reader lets you print from a memory card, and you can also print onto square photo paper. For more details, see our Canon Pixma TS8250 review. What is it? An all-in-one colour inkjet printer and one of the priciest Pixma models around. Key features? This printer doesn’t use ink cartridges, instead working with black and colour tanks that you refill with ink bottles. A window on the front of the printer means you can see how much ink is left at a glance. For more details, see our Canon Pixma G4510 review. To help you find the best printer for any budget, every model that passes through our test lab gets tested on print quality, print speed, scanning, printing costs and more. While a Best Buy printer is easy to use and cheap to run, a dreaded Don’t Buy will cost you more in the long term. 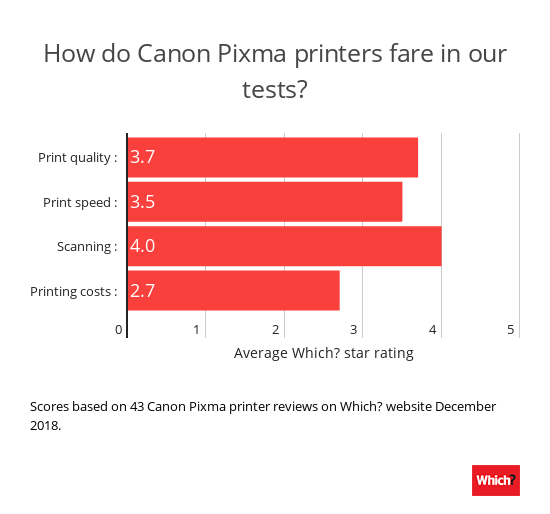 As you can see from our table above, Canon printers generally perform well when it comes to scanning and print quality. But it’s not always good news – we’ve also uncovered some Canon printers that you need to steer clear of. To see how big-name printer brands compare, head over to our guide on the top printer brands. There, you’ll find more information on Canon, Samsung, Brother, HP and Epson printers.